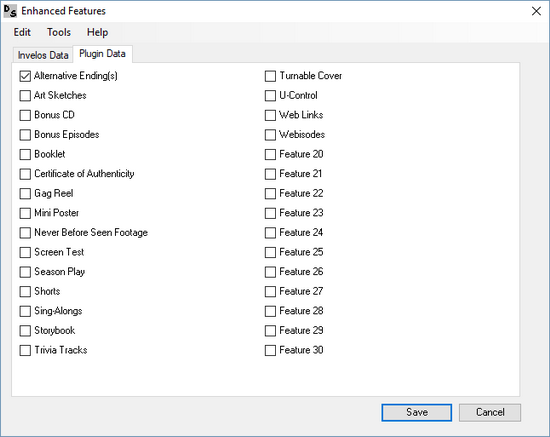 While the Features section of a profile offers a wide variety of checkmarks already, it can't cover all potential features a Blu-ray or DVD offers. An alternative solution would be to use tags instead. Or you can use Enhanced Features. It offers you up to 30 new feature checkmarks which you can label however you like. You can also filter for them or export them to Excel. It also allows you to edit the built-in features in the same window. As usual the plugin can be found in the download section or directly here. Thanks to surfeur51 for the French translation. Also check out Enhanced Titles, Purchase Info & Notes! In the first one, it will output the features and indicate with a Yes or No if it is set. Note: These HTML window examples only use the first two features. These are examples. If you need more features just "paint by numbers". How would the modifications for example three look like to list the features in a row separated by comma? If you are using the apostrope in your feature labels and Enhanced Features in your HTML windows, you need to replace the apostrophe / single quotation mark ' with a double quotation mark ". If in doubt, come here and ask. The first three HTML window examples only use the first two features. The last one uses the first five features. These are examples. If you need more features just "paint by numbers". Huge thanks for the guide lines, DJ. Much appreciated. I will release a new beta version 0.9.2.4 this evening. Please unistall any previous version via Control Center -> Programs and Features before installing any version greater or equal to 0.9.2.4! Very nice plugin. I need to get out more often. Rock on! DJ, is it possible to expand the plugin to a few more slots, like 34 or 36? And here I thought 30 may have been overkill. Care to share what your 30 features are? I have just finished to rearrange my collection. Features were one of the less satisfying area, with data in features, other features, tags and notes. Now everything is in the same place, with filtering easy to perform. I also exported configuration from desktop to laptop (where I have a perfect double), and everything worked perfectly.